Start each day with encouragement for your soul! Each page in Mornings with Jesus 2019 contains a brief Scripture quote, followed by an uplifting devotion that demonstrates how Jesus’ life and teaching apply today. Filled with humor, humility, and grace, writers share insights and reflections that you can relate to. You’ll also find Faith Steps that you can practice throughout your day to help carry the words of Jesus with you and make them real in your life. 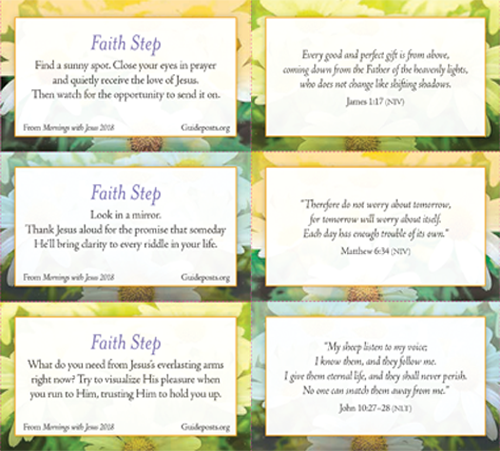 Plus you’ll receive a complete set of 12 Faith Step Cards completely FREE. Put the world on hold and step into the presence of Jesus, who gladly takes our burdens and stress, and restores them with "the peace that surpasses understanding." This uplifting daily devotional book includes 365 short five-minute readings that help you rest and recharge your spirit by putting your focus on the Living God. Each page begins with a Scripture quote, followed by an uplifting devotion that demonstrates how Jesus' life and teaching apply today. With humor, humility, and grace, the writers share insights that are easily relatable. A Faith Step is also included for you to practice throughout the day. The Faith Step will inspire and challenge you to apply the day's message to your life. With humor, humility, and grace, the writers share insights that are easily relatable allowing you a daily escape to center yourself with Jesus’ guidance. For those who are seeking a deeper experience in their relationship with Christ, Mornings with Jesus 2019 offers a fresh perspective of who Jesus is and what that means for day-to-day life. In our everyday lives, we can often lose sight of the wisdom, truth, compassion, kindness, and gentleness of Jesus’ teachings. Now Guideposts has created an uplifting daily devotional book with 365 short five-minute readings that help you rest and recharge your spirit by putting your focus on the Living God. Every day you’ll be given a pearl from the wonderful treasury of Jesus’ words, teachings, and parables to carry with you throughout your day. As you focus on His truth, you will experience an abundance of blessings that spring from your ever-growing personal relationship with Him. As part of the convenient Preffered Customer Plan, you will be entitled to preview future editions of Mornings with Jesus at the price then in effect. You will always be notified in advance so you can decide if you want to preview Mornings with Jesus. There is no obligation to purchase and you may cancel at any time.